This week, as L.K. Advani tries desperately to resurrect his political career post the Jinnah debacle, he grabs his favorite and trusted accessory - the Rath! He must be hoping the rath will conjure up some magic to revitalize his party's sagging performance at the political Wheel of Fortune. One does wish our leaders had vision, and if not a vision then atleast some creativity to keep us engaged. But then, maybe it is just too much to ask for. As Mr. Advani unimaginatively embarks yet again (it's his fourth!!!) on a rath, on Mission Rescue Hindutva & Hindu Rajya (again...), his ideological partners are missing. This time, the RSS and the VHP have clearly distanced themselves from this hurriedly announced yatra. His star performers from the past are missing, including the fire-brand sadhvi Uma Bharati. While Mr. Advani's prime task will be to push the Congress (I) into the corner and blame it for appeasing the minority, is he doing it at the cost of the BJP's own political base? Looking at the past two years of the Manmohan Singh government, the most common grievance is the absence of 'real' economic development. The specter of the Left looms large every time Singh, Chidambaram and Inc wish to cover substantial grounds. The BJP-led government of five years under Mr. Vajpayee is missed for its economic successes. Though India continues to shine for some, the pace of visible growth for the man on the street has slowed down considerably. Infrastructure that was mushrooming up, is now slowly crawling its way into existence. Traditionally, BJP has been a party of the middle class and the business class. And we all know rath yatras don't make good business sense! The last thing that the common man wants is communal tensions leading to social and economic disruption. The blasts in Delhi just before Diwali last year have proved the Common Man's resilience to take new-age terrorism in his stride. If New York can spring back after 9/11 and if London can survive a 7/9, why cant New Delhi? Bangalore and now Varanasi too have shown that while the people are angry, they will not let this affect their will to live peacefully. On the other hand, India is no longer new to this form of terrorism based on religious lines. We have lived with it for decades; first Punjab followed by Kashmir and now any city. In the past, some incidents have sparked riots and violence. And some haven't. However each act of bloodshed has made the divide between the majority and the minority more blatant. All of the acts of terrorism in last few years have been carefully targeted at the Hindu population. And this cannot be just a coincidence. How long will we continue to hide behind politically correct statements denouncing such carnage? The question we need to face is - why us? We can no longer disregard that there has to exist a high degree of discontent and anger, to allow terrorists to breed amongst us. Extremists don't always come from across the border - some of them live among us. What makes them want to kill their own country-men, selectively targeting some? 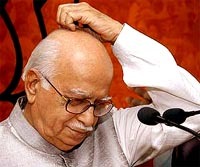 It is about time that Mr. Advani gets off his rath and senses the mood on the street. If he is truly a leader of the Hindus, let him find out why is the minority disenchanted with his vision of a 'Hindu' rashtra? Instead of focusing his attention on whether the nation needs a Ministry for Minority Affairs, Mr. Advani should kick-off his yatra by asking why the Hindus are hated so much. India needs to begin asking uncomfortable questions. Soon. Before it is too late.